Another late movie post. But unfortunately, I've been down with the flu for the past couple of days, which has left me useless. I went from not having the flu for like eight or nine years, to having it twice in under one year. At least it happened to me after the marathon! This week's pick is Buried. I had my eye on this movie for quite a while but wasn't sure how it would be. Having a movie that takes place almost entirely in a coffin doesn't excite me very much, especially since I'm terrified of being buried alive (but not as much as being steam-rolled to death or lost at sea, alone and without a boat. I have a nightmare about it at least once every couple of months). But Phone Booth took place mostly in a phone booth (original title) and it was actually a pretty decent movie, so I decided to give Buried a chance. Buried's budget was only just under two million bucks. But as I mentioned, it takes place mostly in a coffin. It stars Ryan Reynolds, who portrays an American civilian truck driver, based in Iraq. 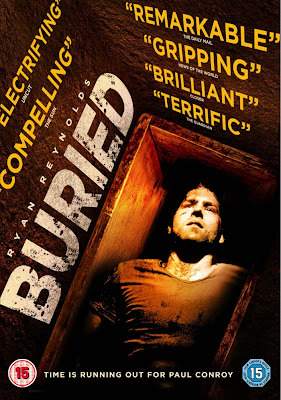 He wakes up to realize he is in a coffin, underground, bound-and-gagged with only a lighter and cell phone. Talk about waking up on the wrong side of the ground. The only thing he can remember about the situation is that his convoy was attacked by a bunch of insurgents, with many of his co-workers being killed during the attack. The cell phone goes off and it's the kidnappers demanding $5 million or else he will be left to die. He doesn't know who to turn to, so he calls the State Department who says they don't negotiate with terrorists. He then calls the Hostage Working Group who tell them they are looking for him. The kidnappers call back, ask him to make a hostage video and then it only gets worse from there. The plot is simple but I found myself emotionally attached to the movie. He knows he may not get out, so he does his best to call whoever he thinks can help him and also tries to get in contact with his family, knowing it could be the last time he ever gets a chance to talk to them. It's one of those films that stick with you long after it's over and is definitely worth checking out.